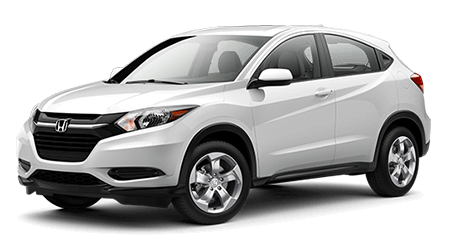 Drivers in the Jefferson City, MO area, can come to Fairfield Honda in Jefferson City, MO to get their hands on the all-new Honda vehicle that everyone's been buzzing about: the 2016 Honda HR-V. This sporty and stylish crossover is Honda's newest offering in the new and exciting subcompact crossover segment. Based on the ever-popular Honda Fit, the HR-V brings all the versatility and good looks of that little wonder to life in a brand new way. In terms of looks, the HR-V is a stylish cross between the sporty Fit and the capacious CR-V, yet it brings a character entirely its own. Styling in the grille and headlights smacks of the CR-V, but the newest Honda trades its big brothers more rugged look for one that is more playful and exciting. The roofline arches high to offer more headroom for all rows, the stately front fenders give this crossover a 'look-at-me' air, and you'll find an innovative hidden handle for the rear doors that brings a sleek and fluid look that drivers will love. Under the subtly sculpted hood, the HR-V's ties to the Fit shine through. The peppy 1.8-liter four-cylinder from the newest Fit models returns, making 138 horsepower and 127 lb-ft. of torque to power a six-speed manual or smooth CVT gearbox. The HR-V can be configured with either front-wheel (manual gearbox models only) or all-wheel drivetrains, which make this versatile crossover perfect for setting out on little off-road adventures. Drivers and passengers alike will enjoy the clean, simple cabin; a step ahead of other, larger Honda models that feature the somewhat cluttered dual-screen layout. Because it's based on the Fit, Honda's intuitive "Magic Seat" makes an appearance, providing owners with three different modes (Utility, Tall, and Long) for carrying over-sized cargo of all sorts. The HR-V offers 24.3 cu.ft. of cargo space with all seats in their original positions and a whopping 58.8 cu.ft. when the second row is stowed in the cabin floor. The newest member of the Honda family has not been tested by the IIHS or NHTSA yet, but Honda projects that this utility-wonder will receive excellent scores in future crash tests. Standard safety features like a rear-view camera, TPMS, traction control, stability control, and a host of advanced airbags. Across all HR-V trims, you'll find full power accessories (locks, windows, mirrors), a tilt/telescope steering column, supplemental controls for the audio system, and Bluetooth connectivity. Optional equipment will include items like a touchscreen console, paddle shifters, push-button ignition, satellite radio capability, leather upholstery, Honda's LaneWatch system, navigation, a sunroof, and heated front seats. Keep an eye on Honda of Jefferson City for more information about this new and exciting Honda model. Honda of Jefferson City of Jefferson City, MO is proud to serve Jefferson City, MO and bring the all- Honda HR-V.